In Nepal, Free Wi-Fi Everywhere Fosters Connections :: By Jennifer Purdie - Integration Through Media ....! Mahabir Pun had a vision: Internet for his hometown. Not such an outlandish idea, even in 1997, except that Pun’s village, Nangi, was in Nepal’s Himalayan foothills. It was poor; it was rural; it was not in Northern California. Pun was frustrated that the only way to communicate with someone in the next village was to walk for several hours, and he thought, although there’s nothing wrong with yak farming and jam making, perhaps his fellow citizens could do better. With a master’s degree in education from the University of Nebraska, Pun had seen how life could be easier, and he had an idea of how to get there. He began with a simple telephone line. After four years of unanswered requests for help from his own country, Pun wrote an email to the BBC asking if it would do a story on his project, and the news organization published two articles, helping to catapult his vision to fruition. District Development Officer Bishnu Prasad Sharma found the people of Myagdi inspired him and his fellow committee members to move forward. “In Myagdi, the local educated people started using the Internet,” he said. They began marketing their businesses, and profits spiked; other villagers took notice, and interest in the Internet grew. Contributions from the entire community are funding efforts to build Wi-Fi district-wide. That would mean more than just local bragging rights. Children in the 175 villages receive access to a new educational pathway. The project is partnering with Open Learning Exchange to develop interactive educational materials; students now have access to more than 5,000 books to read online or download, and OLE provides training programs for teachers to help them get accustomed to the idea of—and get the most out of—digital classrooms. The wireless project aims to include live “teleteaching,” beaming a teacher to several students gathered at separate locations. “These kids live in huts and eat on dirt floors, but they have access to incredible architecture of the modern world,” said Mucci. Along with education, health in the region has received a boost since Pun’s vision was realized. Teleconferencing with Kathmandu Model Hospital in the capital began enabling video assistance to be provided to several Myagdi District villages in 2010. “We can connect to small health clinics, provide some rudimentary training, and offer health care services,” said Mucci. When Pun started the project, he was more interested in improving the economy and using technology to leverage Nepalis’ potential in the areas of trade, health care, and education. 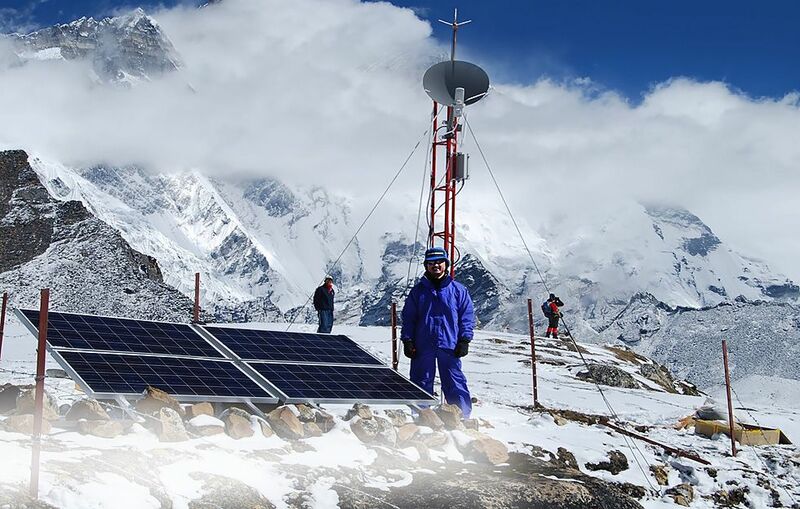 Yet the human connections have made the biggest impression on Nepal Wireless Networking Project team members. Sage Radachowsky said, “In this subsistence Nepalese economy, some people go abroad to work and send money home. The project helped by providing access to those people far away.” Villagers can access VoIP telephone service, which the project charges for, funneling proceeds from users back into the village. On one visit, Mucci heard a woman speaking on the phone to her son, whom she hadn’t seen in five years. “That was pretty powerful,” he said. :: About Author :: Jennifer Purdie has written for The Los Angeles Times, USA Today, and many national magazines. She has completed marathons on all seven continents.